For GCU sophomore Elizabeth Pabst, the theatre has always called to her. 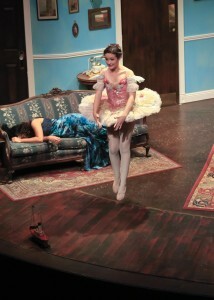 Elizabeth Pabst as "Essie" in "You Can't Take it With You." Her true venture onto the stage, though, came in high school. She always had played sports but didn’t have the time to do both. So she hung up her soccer cleats and threw herself wholeheartedly into theatre, and she hasn’t looked back. “I don’t regret the decision at all,” she says. Pabst originally planned to study education, but GCU offered her theatre scholarship and she couldn’t turn it down. Last year, she appeared in “Inspecting Carol,” “The Comedy of Errors” and “The Frogs.” She’s currently playing the role of Essie in the Pulitzer Prize-winning play “You Can’t Take It With You,” a comedy that opened the Ethington Theatre Series last weekend and has a final weekend of performances starting Friday. 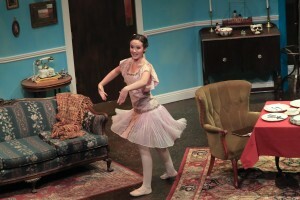 Essie is the adult daughter of a quirky but endearing family whose eccentricities provide for some comical situations. She also loves playing the role of Essie, the oldest daughter of the household, an aspiring ballerina even though she has no talent at all. Essie spends most of the play frolicking around the house, practicing her ballet moves every chance she gets and making candy for her husband, Ed, to sell. Like the rest of her family, she’s odd but full of love and sincerity. To prepare for the role, Pabst researched ballet techniques and choreography. Director Claude Pensis called on her to create her own choreography for the role, to keep the look amateur and not professional. Pabst found this to be harder than expected. It paid off, though, because reviews of the play’s opening weekend — and her performance — have been positive. wait i thought i was essie. great job lizzie! This is a great article, Elizabeth! Congratulations! Hard Work does pay off.